These guys spent allllll day Sunday doing some key things to get our bathroom renovation back underway. 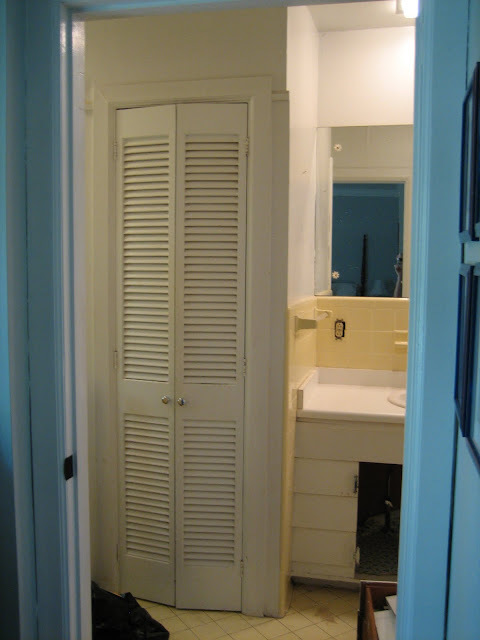 This awkward closet was in the middle of the rectangle bathroom, in between the bathtub on the left and the sinks on the right. David and I did all of the demolition and had the closet down to its skeleton (forgot to get a picture of that phase- sorry! ), but we were afraid to pull the closet studs up based upon the fact that they could possibly be load-bearing (load bearing: remove it and the ceiling will likely fall in). So, we waited for the expert (my brother-in-law, Nathan) before we went any further. Lucky for us, Nathan quickly determined that the studs were not load bearing and so the guys were able to tear out the skeleton of the awkward closet pretty fast. Voila! We've got a nice, clean slate! This fun little task basically meant more demolition. In order for the plumbers to redo some of the plumbing, they need to have access to the pipes in the floor...ie. in our basement ceiling. So David and Nathan cut a huge chunk of our basement ceiling out. Here's the aftermath of that work, behind the plastic wall. And a view through the bathroom floor (down to the studs) of the mess in the basement. I know, take a deep breath with me. LOTS of mess. I told you shocking images!! But, David had the day off of work Monday and has since cleaned our basement (um, he even pulled out the mop!) and turned it back to perfection the decent shape it was in. I told you! My man rocks! And now, all 300+ pounds of it is.... in my driveway. What, a bathtub in the front yard is not normal?? WonderBoard yet- the stuff that goes down right under the tiling- because the plumber would have to cut into it. (Or something like that- Nathan will correct me via comment if I got this wrong!) But they were able to put down the first layer of the flooring- plywood board- on top of the studs. Hooray! Yay! Never thought I'd get so excited over plywood. Since I bombarded all of you with ugly pictures today, I promise to share some pretty pictures tomorrow of a fun little paint project I did to one of my Christmas presents!! Bless you my child...I've been through Waaaay too many bathroom renovations (not by CHOICE) to not sympathize with you now! You will be so thrilled in the end...take a deep breath and keep going!! WOW you are doing a HUGE rennovation! They definitely deserve some major props for that! I can't wait to see the finished result! Oh my gosh, you poor thing!! I can only imagine how crazy all of that must be! But just think, it is going to look FABULOUS when ya'll are done! I can't wait to see more pictures! I have no words. So were you cracking up at my little closet makeover today. WOW! You guys are rocks stars. I am seriously in awe. I feel like I am watching a great movie and am at the cliffhanger part! Give me more, sistah!!! Wow, girl, what a HUGE project! 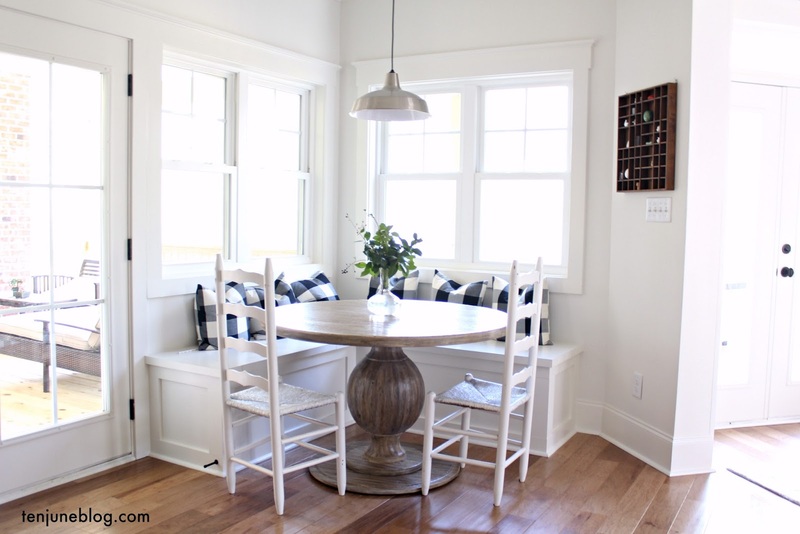 Love when bloggers take on big projects! Can't wait to see the layout and how you chose to decorate it. Be back tomorrow to see the paint project (: love ya! Talk about a big project. You make my bathroom reno look like nothing compared to yours! Can't wait to see the final product! Thanks for the support, ladies! It is a huge undertaking... but that 1950's bathroom NEEDED an update! :) And it's literally the only "big" project we have had to undertake, which is pretty good for an old house. I wish it weren't such a slow and steady process, but hopefully it will pay off! Oh I don't know how you are dealing, I would have to keep a print out of my inspiration by all the mess to remind myself why!!! You're a brave one mrs. Ten June. Ooo that looks like FUN though! I'm sure it's going to look so beautiful by the end that it will more than make up for the messiness now, ha! WOW! What a big job?!? Sounds like you're dealing with it beautifully though! :) Can't wait to see the final layout! I wish so so much that it was my bathroom that looked like that! You must be so excited! Awesome! I'll take some credit, but you guys had the hard stuff done when i got there...except for that ridiculously heavy tub... Keep up the good work. I am a new follower!! Looks like you guys are hard at work!! Can't wait to see it finished!! Just looking at the photos makes me all giddy! We start our kitchen in T-minus 30 days....oh, the fun! We did similar "fun" projects in our bathroom. Good luck with the rest of your project. Cheers! OMG u guys have a lot of work ahead!!! I bet it's gonna be so beautiful!! I hope you post pix when you're done!! Good luck!! Oh yes, now that is a mess!! It's going to be so great though. :) Thanks so much for linking up Michelle! Wow! So fun to have a new bathroom in the near future, though, no?